Ms. Aronson serves as the Chief Information Officer for the National Science Foundation. 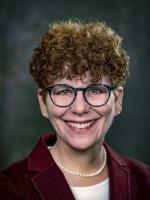 Ms. Aronson is uniquely positioned to effect positive change after serving as the Director for the Division of Information Systems at NSF since 2011. As a highly skilled and gifted creative thinker, strategist, and artist, Ms. Aronson is highly skilled at linking mission and strategy to IT tools which enable the Foundation to manage the full lifecycle of proposals and awards. She was recognized as one of FedScoop’s Top Women in Technology for 2018, and, was recognized in 2013 as one of the FCW Fed 100 for her mastery of innovation and for her ability to effectively engage her staff around a common vision for cutting-edge IT in support of NSF-funded cutting-edge research. Ms. Aronson’s deep understanding of IT, coupled with her commitment to the NSF mission, its employees and to the American taxpayer, have been instrumental in her ability to manage an organization of over 300 talented IT innovators who feel equally engaged, connected, and empowered to find creative solutions to IT’s most challenging dilemmas. Prior to her time at NSF, Ms. Aronson served as the Director for the Office of Management Operations for the Defense Advanced Research Project Agency. She holds a Business degree from Duke University and is committed to lifelong learning.